MAKE YOUR NEXT ROAD TRIP A RUN! Registration for the August 2 - 3, 2019 Wild West Relay and for the September 6th - 7th Flaming Foliage Relay is open! Is there anything more fun than a road trip? You pile a bunch of like-minded souls into a car and set off to explore wild and beautiful places in the spirit of camaraderie and adventure. Now consider taking your running one step further by getting out and running your next road trip! Explore scenic and special places far from your normal running routes and redundant race courses, and make it even more special by doing it with a group of friends or family. Welcome to Road Less Traveled Relays, a small runner owned company dedicated to putting on relay races. Our relays will take you through beautiful landscapes and across diverse and challenging terrain in some of the most iconic locations in the country. 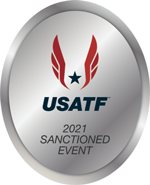 With events in Colorado and Oregon, we have designed races that are achievable by all levels of runners. While each course is unique in terms of terrain, distance, and difficulty, all of our races have one thing in common: a friendly vibe and an incredible, runner-focused experience. There are other running relays out there, so what makes RLT Relays different? Our focus is threefold. First, you - the runner - is our priority. Our races were designed by runners, for runners, with industry leading innovations and organization that put the experience of the runner first. What that means for you is a race experience unlike any that you've had before. Our goal is simple: we want you and your friends to go out, challenge yourselves, have an amazing time, and make some memories that you'll never forget. Second, we have searched out scenic, rural routes to make your experience more unique.. We take the road less traveled. And third, we give back to the communities our races pass through through our Volunteers With a Purpose program. While each of our relays has its own unique character, the idea is the same: You and your friends pile into a van and set off for the running adventure of a lifetime. You support each other, cheer for each other, and keep each other awake when the night gets long. You might cry, you'll almost certainly laugh, and you'll build memories and bonds that will last a lifetime. Our races range from shorter 50-mile "sprint" distances to overnight 200-mile epics. The courses are divided up into multiple legs that vary in distance and difficulty so that there is a leg to suit nearly every runner. Team size depends on the length of the race (see specific race pages for details), but rest assured that no matter how many of your friends you can entice into joining your team, you will have a blast and challenge your previously perceived limits. Our long distance relays consist of 10 or 12 (maximum) or 5 or 6-person (Ultra) teams that rotate through 30 or 36 legs as they cover the 165 - 200-mile route. This means each team member runs 3 legs (6 for Ultra teams) of varying distances, averaging a total of 17 miles (33 for Ultra teams). One person is running at a time, while the rest of the team is cheering or resting. At the end of each leg, the next runner on the team takes off when your current runner arrives - thus a "relay." The adventure is that your team will run all day, through the night, and then finish the next day. Sprint relays consist of teams of 5, are about 50 miles long, and are divided up into 25 legs of about 2 miles each. Thus, there is a fast turn-over of runners. But it's not all about running; it's also about having fun. The camaraderie that happens on the team (and amongst the teams) is a big part of what makes our races so special. We encourage you to throw on some costumes, decorate your van, and get to know your fellow runners. In short: we want you to have a freaking blast out there. This is about building a sense of community both on and off the race course. 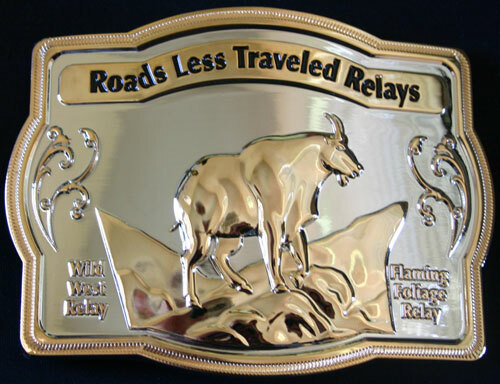 Runners who complete both the Wild West Relay and the Flaming Foliage Relay in the same year, earn a Colorado Mountain Goat Belt Buckle (4" x 3"). We organize our relay races with one thing in mind: you. Keeping the runner in the forefront of our minds during the development and execution of our relays has allowed us to implement multi-component running events that benefit both the runner and the community. Our relay races are developed to not only provide an unforgettable experience for the runner, but to also support the surrounding communities. That's why we created our non-profit Volunteers With a Purposeprogram - to involve and give back to local non-profit organizations and communities around each relay race's area. What's more, we ensure a positive race experience for you with a sensitivity to the area. We cap our relay race entries to ensure that the course isn't overcrowded, and so we can stage a race on the most scenic and picturesque trails an area has to offer. The building of camaraderie between your team and those you are running against, as well as sleep deprivation, van decorations, costumes, and silly inside jokes adds to the fun and uniqueness of a relay race. If you've never done a relay before, or are considering being a team captain for the first time, please read Relay 101. One of the things that makes our races really special is that we're not just trying to provide a positive experience for our runners. We're also trying to help the communities that our races run through. We have raised and distributed over $270,000 for local charities through our 501(c)(3) nonprofit organization, Volunteers with a Purpose, Inc. See each race's Volunteer Options page for more information (we pioneered the concept of giving teams the option to involving non-profit organizations in relays as the race marshals through a donation - we are the only relay that does this through a non-profit organization making your donation tax deductible and transparent). We also donate 1% of our total revenue to environmental organizations through our membership in 1% For the Planet. Reducing our environmental impact through noise control and green practices: we donate one percent of our total revenue to environmental organizations through our membership with 1% For the Planet (since 2006). We invite you to take a look at our races and to celebrate running with us. Your races are SUPERBLY RUN and the standard by which all relay events should be judged. My first year with your relay though I had competed in several other versions in the past. Your event stands head and shoulders above the other two companies I have experience with. When you start this adventure you think this is just about being crazy and running; but, you soon learn this is about relationships and analogous to life in general. In the early legs of life you start with ambition, energy and excitement. In the tougher legs of life you rely on your friends, will and desire or determination to get you through. Feel free to contact us if you have any questions regarding our relay races. Welcome to Road Less Traveled Relays, a small runner owned company dedicated to putting on relay races. Our relays will take you through beautiful landscapes and across diverse and challenging terrain in some of the most iconic locations in the country. With events in Colorado, Vermont, Oregon, and Iowa, we have designed races that are achievable by all levels of runners. While each course is unique in terms of terrain, distance, and difficulty, all of our races have one thing in common: a friendly vibe and an incredible, runner-focused experience. Here is a collection of runner's blogs written about their experience in a Roads Less Traveled Relay. Curious how scenic our races are? Here are photos taken during our relay races. Click here for runners who completed the Wild West Relay & Flaming Foliage Relay in the same year.